bounty. This recipe could be easily converted to a vegetarian salad. I’ve not had any success growing tomatoes in Arkansas this year, but the garden herbs are bursting forth. It’s wonderful on hot summer nights to not turn on an oven! Toast bread slices until lightly browned. Allow to cool, then dice into size of large croutons. Mix dressing ingredients and allow to meld while preparing the other ingredients. Peel (if desired) and dice the cucumber. Slice the salami into 1/2 inch by 1 inch strips. 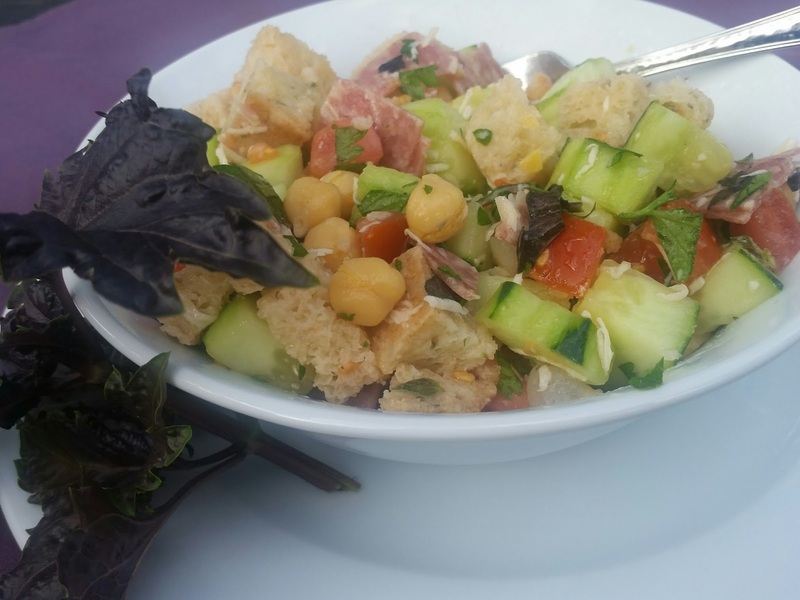 In a large bowl, place the croutons, vegetables, chickpeas, parmesan and fresh herbs. Pour the dressing over the salad, stir. If necessary, add a small amount of additional olive oil and lemon juice. Allow to sit for 30 minutes, then serve and enjoy. An entire meal in one dish! This entry was posted in Lookout Point Lakeside Inn, Lunch and Dinner Entrees, Sauces Toppings and Salad Dressings, Soups Salads and Appetizers, Vegetables and Potatoes by admin. Bookmark the permalink.